Developed to exceed museum standards, this premium inkjet paper lends exceptional beauty and character to black-and-white and color photographs as well as fine art reproductions. 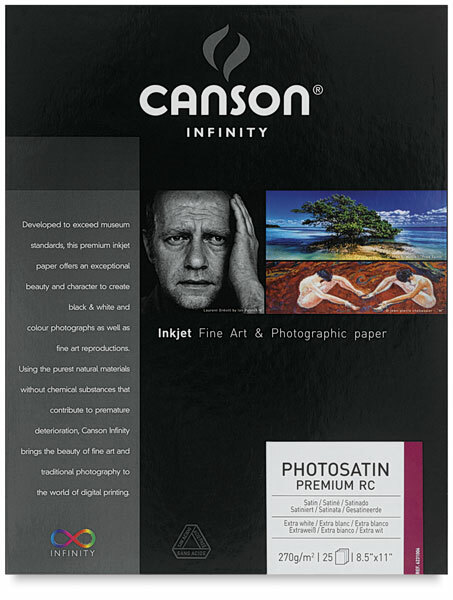 Canson Infinity PhotoSatin Premium Resin Coated Inkjet Paper is an acid-free, alpha-cellulose art paper coated with structured polyethylene and a micro-porous receiver layer, designed to comply with the highest lifespan requirements. Its surface aesthetic is reminiscent of the original photochemical papers traditionally associated with the Baryta market. A great choice for black-and-white or color photography, it adds softened reflections to photographs. This paper is compatible with pigmented and dye inks, dries instantly, and is water-resistant and fade-resistant to guarantee maximum conservation of prints.